Cesar Sayoc Jr. has been arrested and charged with sending a series of pipe bombs in the mail to prominent critics of Donald Trump. The Department of Justice complaint against Sayoc helps explain why they believe he is the culprit. 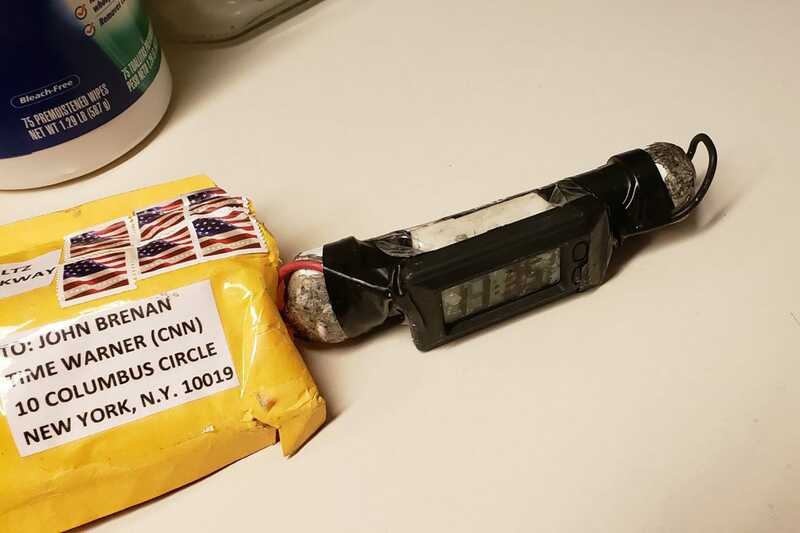 It cited a single fingerprint on one of the 13 packages, and also poor spelling common to addressees on the packages, and a Twitter account linked to Sayoc. Sayoc is in detention and is expected to appear in court on five federal charges Monday. The man suspected of sending pipe bombs in the mail to prominent critics of US President Donald Trump was pinned down partly thanks to a stray fingerprint and repeatedly poor spelling. Cesar Sayoc Jr. has been charged with sending 13 packages to figures including former presidents Barack Obama and Bill Clinton, other prominent Democrats, government officials, and the actor Robert de Niro. The criminal complaint against Sayoc, published by the US Department of Justice, says that a single fingerprint on one of the 13 packages was a match with Sayoc, and helped them identify him. It also said that agents were sure of his identity because of matching misspellings of the names of Hillary Clinton and Debbie Wasserman-Schultz, found both on the explosive packages and on a Twitter account linked to Sayoc. Sayoc was arrested Friday in Plantation, Florida, near his Dodge Ram van, covered in stickers praising Trump and hostile to his critics. CNNThe bomb sent to former CIA Director John Brennan, one of the 13 targets. He had been charged with five federal felonies, including mailing explosives and threatening a former president. Here’s everything we know about him. In the complaint, FBI Special Agent David Brown says that “a latent fingerprint” was found on a package mailed to Congresswoman Maxine Waters in Washington, D.C. He said it matches a fingerprint held on file by law enforcement officials in Florida, where Sayoc has a long history of arrests. Brown also said that a DNA sample found inside a package sent to Obama was also a match with Sayoc. So far no other DNA evidence has been found in other packages, he said. Another strain of evidence was poor spelling common to the packages and the @hardrock2016 Twitter account, which the FBI believes was used by Sayoc. Brown noted that the account, since been suspended, repeatedly misspelled Hillary Clinton’s first name as “Hilary,” an error that was also on the pipe bomb sent to her. He added that both the packages and the account misspelled Wasserman-Schultz’s name, which was rendered “Wasserman Shultz” instead. Wasserman-Schultz was used as a return address, so her name appeared on multiple packages, one of which, addressed to former Attorney General Eric Holder, ended up at her office. Sayoc is expected to appear in court on Monday.